Revel in this historic urban chic condo with its bright and airy feel. 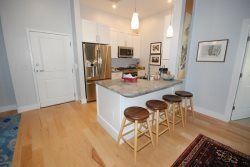 This is a first floor 2 Bedroom 2 Bath condo in the desirable and historic West End District of Portland. A 2014 Architect rebuild created a magical space that has best of everything. Enjoy the upscale features including stunning hardwood floors, top of the line granite countertops, custom kitchen and bath cabinetry, natural gas range and oven, and quality stainless appliances. Bedrooms include their very own ensuite bath with beautiful tiled shower with glass enclosure and vanity for storage. Each bedroom includes a queen size bed with top of the line linens, a flat panel television, and dresser. Condo includes a private full-size stackable washer/dryer, efficient heat/AIR CONDITIONING units, energy efficient windows and one dedicated off-street parking space. Lewis Street is in Portland's Historic West End, a neighborhood that is praised for its walkability, amazing restaurants and markets, and its urban setting. It’s quiet yet close to downtown Commercial St with more restaurants and shops. Walk to the Western Promenade, relax at the park and enjoy the greenery and views of the Fore River. Lewis Street is perfect for a couples retreat or families of up to 4 people. Our (4 college friends) weekend in Portland was wonderful and the beautiful VBRO set the stage. The 2 bedrooms and 2 baths were perfect when we were all trying to get ready at the same time. The place was very clean and beautifully decorated. The only small complaint was we were short one bath towel- luckily one of the gals had a beach towel. This is perfect for 2 couples, a small family or a girls weekend away! Great neighborhood and easy walk or UBER/Lyft to downtown. We will be back! This apartment was wonderful. Clean, comfortable, and very well equipped. AC/Heating units were very efficient, as was the washer/dryer in the unit. Location is perfect, within walking distance of restaurants and downtown Portland, and close to Cumbies and Rosemont Market for last minute items. The kitchen had everything we needed and we cooked full meals in the apartment almost every night. We will definitely go back to this property again.Recommended for: Families with Young Children, Sightseeing, Girls Getaway, Tourists without a Car, Age 55+, Romantic Getaway, Families with Teenagers.